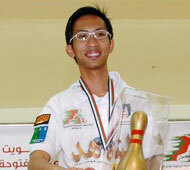 14th April, Kuwait: Doha Asian Games gold medalist, Ryan Lalisang of Indonesia, bagged the coveted 4th Kuwait International Open Bowling Championship title after defeating challenger, Mohammed Al Kubaisi of UAE, 234-217 on Saturday evening. After lying 16th in the Top 16 Finals, the Indonesian bounced back with a strong 2406 winning 8 out of the 10-game Top 16 second block finals as top seed for the stepladder finals. The Jaya Ancol bowler scorched the Cozmo Bowling Center with lines of 269, 265, 243, 231, 240, 245, 241, 233, 204 and 235. Mohammed Al Kubaisi, who finished second earned a carck at the title after he knocked out England's Nick Frogatt, 212-169 before going down to the champion. Frogatt, who was fifth-seed, also eliminated fourth-seed, Martin Larsen of Sweden, 211-194 and fourth-seed, Andres Gomez of Colombia, 211-194 in the earlier two matches. with 3720. Australia's Jason Belmonte, who topped the Top 16 round 1, just missed the cut for the stepladder finals in sixth position while qualifying round leader, Tim Mack of USA finished tenth. Meanwhile, Vanessa Fung of Hong Kong, upset top-seed, Kim Eun Jung of Korea to regain the title she won two year ago with a victory over the Korean in two matches. 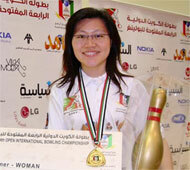 Fung won the first match, 234-214 and clinched the title with 191-182 in the decider. The champion had earlier edged Nasha King, 196-189 to set up the match with the top seed. Nasha, who was third-seed, defeated fourth-seed, Aliaa Ismiel of Egypt, 213-166 in the first match before loosing to Fung in the second match. The top 16 Asian men qualified for the ABF Tour Kuwait leg which will be held at Cozmo Bowling Centre Sunday, 15th April. Live scores will also be featured at www.abftour.com. Copyright © Asian Bowling Federation, 2007. All Rights Reserved.